If you want to see some clues as to what the new Mike Ashley House of Fraser might look like, then a good starting point are the new Sports Direct/USC/Flannels superstores. One of the latest is at Lakeside where a 10,000sqm sports and lifestyle experience has taken shape. The Mike Ashley’ jigsaw put together piece by piece. Recent years has seen a subtle move at Sports Direct from just “Pile it high. Sell it cheap” to a more controlled, more organised and less densely displayed proposition. An upscaling of the brand portfolio has been facilitated with a higher level of store disciplines and visual merchandising ownership. There was also the buy-out of Republic and its exclusive brands such as Soul-Cal. Although, seemingly in a state of stagnation under the resurrection of the USC brand it now seems that as a re-energised “US Collective” proposition its time to shine has also arrived. Then we have the more recent acquisition of upmarket lifestyle retailer Flannels with a brand portfolio from Boss and Calvin Klein to Versace and Lanvin. Traditionally based in northern city locations the demographics and geographies fit well. The strength of the new superstore is in its clear thinking and simple delivery. It lacks the legacy baggage of the brand-led department stores and the complexities of ill-fitting spaces. It could be argued that the Sports Direct/USC/Flannels proposition is one of good, better and best. In terms of its physical delivery and shop-fit investment this may well be the case however the distinction in terms of customer profile is subtler. There are no complex marketing models. This is the Sports Direct classic customer base, plentiful and price sensitive, but with additional aspiration and occasional disposable income. They will shop across the three areas, dependent on their end-use and budget. Three propositions with three distinct deliveries. Space thinking is clever. Sports Direct & USC share the same entrance and the same space block along with similar affordability. USC is upstairs as destination. Sports Direct is “in-you-face” ground level. The Flannels block is adjacent but accessed through a different entrance introducing the more distinct and upscale atmosphere. Across the three propositions visual signals are clear. The density decreases as the average price of each increases. This is supported with classic variances of visual merchandising display as frontal hanging and folded evolves into single-level lateral presentations. And whilst the materials and colour schemes journey from heavy duty black, through translucent plastics and fabrics to soft carpets and subtle shades all the areas share practical physical structures. It’s all so simple and oh so effective! So, there we have it. 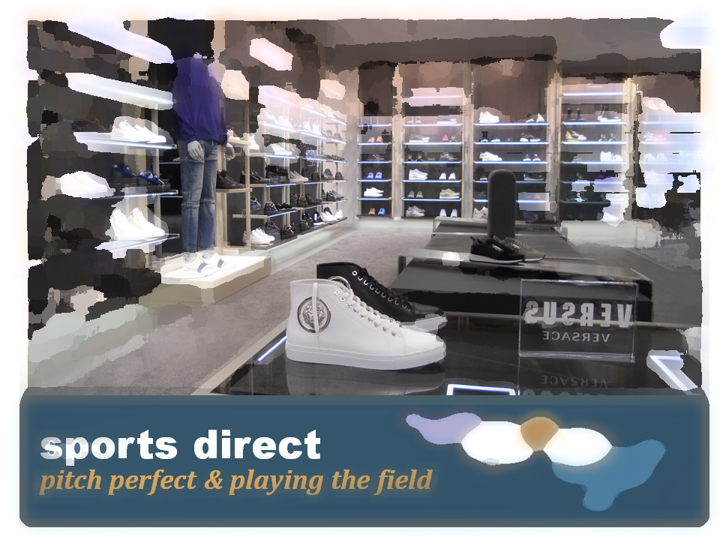 The blueprint for a new Sports Direct brand experience empire, or a stepping stone to the Harrods of the High Street? It doesn’t make the imagination work too hard to see a simple evolution of the new Sports Direct beauty assortment to a full health and beauty proposition. Store experiences such as the recent additions of an Everlast fitness gym, recharge areas for men and women, an urban-inspired kids’ zone with selfie mirror, plus plans for an e-sports arena, are ready and ripe to be extended outwards and upwards into new avenues of engagement and new levels of pampering. The Harrods comparison is of course no more than bravado, a statement of intent. However, it reflects a clever strategy firmly directed at a customer base that desires aspiration, that takes its brands and logos very seriously and is equally proud to show them off. All that glitters isn’t gold, but a little decadence could take Sports Direct all the way to the bank. What’s your strategy to maximise the spending of your core customer? Are you satisfying their aspirations as well as their needs? We’d love to hear your experiences? I'm Tim Radley and I started VM-unleashed! in 2007, and as the one who makes most of the decisions, and does most of the work, then I guess that makes me the Managing Director. I've now been doing this sort of thing for over 20 years now, so hopefully i know my way around the retail block ...but hey, what do I know? Retail & the Circular Economy: Square Pegs in a Round Whole?